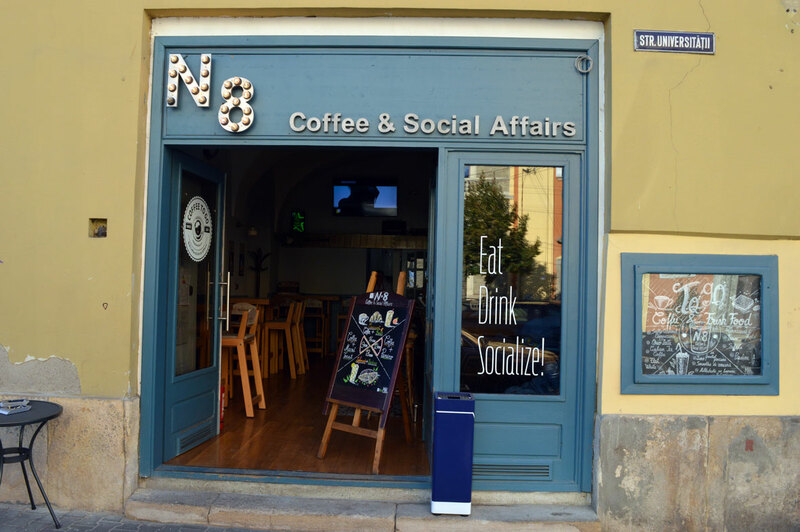 N8 Coffee & Social Affairs is more than a coffee shop, it’s a good choice for a temporary office. It takes you only 2 minutes to reach it from Unirii Square, the heart of Cluj. It is located on Universitatii Street and it is just 7 minutes away from the bus station. It is easy to reach N8 Coffee if you’re coming with the bus, or even by walking from Unirii Square. We recommend you to come with one of the bikes offered by ClujBike because the station is just one minute away. There is a car parking just in front of the location, but being right in the downtown it’s hard to find an empty spot. You will find a power plug next to each table, so you don’t have to worry about where to stay. We recommend you to sit on the couch because then your laptop screen won’t be in the other’s view, so you can keep you informations private. When we visited the location there were also other people with their laptops that worked from here. Internet connection was very good even if in the location we noticed 5 people sitting on their laptops at the same time. N8 Coffee is also suitable for meetings because it offers you plenty of space and you can put together more tables for your team. The spot that you see in our 4th image is perfect for your team. If you are a student at Babes University we consider that this is one of the best places where you can meet your colleagues to work on the projects and it is just 2 minutes away. Being surrounded by other people with their laptops, having a power plug just next to you and a good wifi connection are the key ingredients that make N8 Coffee a good place to Work in Cluj. Recommended to try: Salty Caramel Latte, cocktails – Taste of Amalfi , Charlize Theron (barman speciality). When we visited the location we were very happy to see other people with their laptops. That made us feel comfortable and not look like some strangers with their laptops. When we visited the place the internet speed was very good. Having a power plug next to you will make you sit in here for hours. It might be a challenge to find a free parking because it’s placed right in the downtown, that’s why we recommend you to come with ClujBike or with the bus.